Innovators and entrepreneurs will benefit from a new phase of the SPRINT accelerator, announced byUCC President, Prof Patrick O’Shea at Gateway UCC. The SPRINT accelerator, now in its second year, is particularly focused on commercialisation of research and market access for novel solutions. 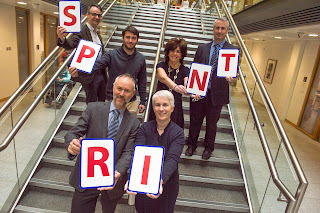 Leveraging the experience of successful entrepreneurs and mentors, business support agencies and expert business coaching, the SPRINT accelerator provides support to drive commercial success, accelerate route to market and ultimately create jobs from leading edge solutions developed by researchers in UCC. The accelerator is supported by Gateway UCC, Bank of Ireland, Enterprise Ireland, Cork City LEO (Local Enterprise Office) and Cork City Council. SPRINT II has already signed up 12 early-stage startups, including onewhich offers technologies for constant monitoring of brain health for at-risk newborns and a new diagnostics platform for IBS (irritable bowel syndrome), which is the most common gastrointenstinal disorder affecting over 40 million people in Europe alone. As well as med-tech innovators, SPRINT II participants are also commercialising solutions in renewable energy (both hardware and software), data analytics, emergency management and scientific instrumentation among others. “Enterprise Ireland works closely with emerging companies to ensure that they can access global markets, attract investment, create jobs and scale quickly. Increasing the number of high potential startups from 3rd level is a key focus of Enterprise Ireland’s strategy and we are delighted to support the SPRINT Programme which identifies and supports exciting leading edge technologies being developed in UCC,” said Martin Corkery, Regional Director at Enterprise Ireland. Success stories of 2016 SPRINT programme were recognised at the launch of the next round of the accelerator. UCC President Pat O’ Shea presented the “Sprint’s Most Investible Start Up” Award 2016 to emerging medical device company, Skellig Surgical, which focuses on development of user-centred, minimally invasive technology. The UCCPresident also presented the “Sprint’s Most Revenue Generating, Market-Ready Award” to Food Choice at Work, which delivers the ultimate healthy eating management system in the workplace. Both companies are resident in Gateway UCC and together they employ 12 people currently. The SPRINT Accelerator is the first structured learning programme from commercialisation in the University covering the A to Z of how research led business are formed and scaled. The state of the art facility at Gateway UCC provides a unique support ecosystem for start-ups including mentoring and business coaching, access to financial advice and startup funding, specialist seminars, workshops, introduction to venture capital opportunities, business angel networks and access to UCC’s network of researchers and facilities together with excellent support through linkages into academic departments. Since opening in 2011, GATEWAY UCC Business Incubation & Innovation Centre has supported over 40 start-ups, which between them now employ 250 people and contribute an estimated €15 million in wages and €5 million in tax annually to the local economy.